Impact Data Books, Inc. - Modular, Premade, Custom Data/Log Books! Custom book design is what Impact Data Books, Inc. is all about. Now it's possible to get 100% of what you want and need in your data book. We can take your course syllabus and design a book to match it from shot to shot, drill to drill. Not only will this eliminate wasted time on the range trying to teach each student to use their book but it will give your course a quality, professional looking book that works. The days of modifying your pages on the range are gone allowing your students to easily follow along saving time while maintaining a professional looking book. Customize your book cover with Agency or Unit Crests and logos. Design the book to work around your courses day to day activities. Have your book setup to follow your qualification course to maintain an accurate log. Design specialty pages for your specific mission. Add commonly used reference and mission specific information. All custom orders will have a $35 setup fee. Submitted customized targets and ideas become property of Impact Data Books with the ability to offer for sale to general public unless another agreement is worked out. Custom front logo design is offered on the front of books. Impact Data Books company logo will also be incorporated and printed on the cover. Impact Data Books request that a refill flyer page be added to the end of all books. Custom orders require a 50% down payment at the time of order before order will be submitted to printer. Once final designs and layouts are agreed on and order is shipped to the printer there will be no refunds. Custom page design is a great way to incorporate realistic head targets or the actual pages you use in your day to day shooting sessions. You now have the ability to have your book setup and work with those targets. We can also modify our page layouts and adjust them to what you want or need. The only limit is your imagination. - Design specialty pages for your specific mission and needs. All custom page orders will have a initial $25 setup fee. Template or a total page remodification will be a price on request situation. Submitted customized targets and ideas become property of Impact Data Books, Inc. with the ability to offer for sale to general public unless another agreement is worked out. Having a custom round count book designed for gunsmiths and gun companies allows you to place your logo and contact information on these much needed books. This not only allows the gun owner to have quick access to information on their weapons barrel life but information to the company that built their weapons system. All custom round count book orders will have a initial $25 setup fee. Submittion of a high quality .jpg and company contact information is need to do the cover layout. 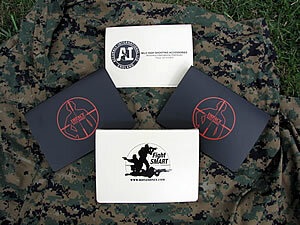 Here are a few of the many custom made Round Count Books Impact Data Books Inc. has made for the shooting community. 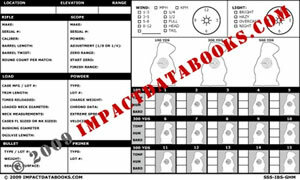 Here are a few of the many custom made binders Impact Data Books Inc. has made for the shooting community. We have been very busy creating custom books, binders and pages for military, law enforcement, competitive shooters, as well as many gunsmiths and shooting schools. Don't miss out on getting a 100% customized data book that meets your needs from you your leading source in data book production. If you are interested in ordering a custom book, a custom round count book, or a custom designed page, please drop us a line here.